I continue to circle tow ards the foreign language shelves, but there’s still some space left in the Dewey Decimal system before I get there. The 410s are linguistics, pretty much indistinguishable by the collection at the local library from the 400s, language. From there I selected this book, caught by the punning title. Like Harrison in my last linguistics book, McWhorter allows himself into the narrative, but these end up being the weaker parts of the book, when McWhorter talks about such things as his French girlfriend’s dismissal of his use of the first-person plural where contemporary French usage has dropped that conjugation in favor of third-person plural or his difficulty understanding a regional dialect of German. 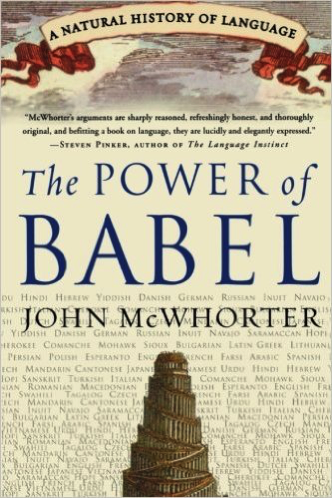 But outside of these personal anecdotes, McWhorter does a good job of explaining the variety of languages on earth, the shaky distinctions between languages, dialects, creoles and pidgins and how languages influence each other, all of which I found informative just in my usage of English in my own writing.